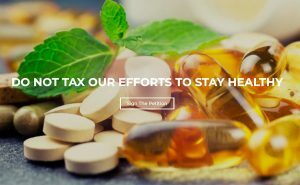 No Health Tax – Act now! :: PRESS RELEASE :: Government wants it both ways on health. 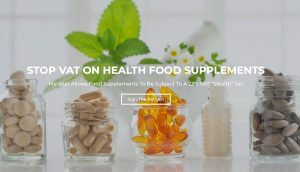 In news which has sent shockwaves throughout the entire health and vitality sector, the Minister for Finance is reported to be eyeing up placing a flat rate of VAT on the majority of health food supplements. Most food supplements (excluding sport nutrition and beauty supplements) have had a traditional VAT rating of 0% for over 40 years. Without legislation enshrining this, Revenue have committed to applying VAT at 23% on all food supplements from January 2019. Given the historical statements of Leo Varadkar on the issue of resourcing preventative healthcare, this is seen as a somewhat contradictory stance for the government to take up now. Speaking on the Health (General Practitioner Service) Bill 2014, the then Minister for Health Leo Varadkar is quoted as saying – “This particular measure is the keystone of the Governments policy in the area of primary care…… we are shifting the focus of healthcare from hospitals to the community, and from treating illness to maintaining good health“. This tax if implemented on Healthcare products would eventually result in more need for HSE treatment! I am the mother of a special needs son who has been sick since he was four years old. I cannot say enough about how much he has improved since taking Super 8 Gold, Udos Choice Oil and One Nutrition D3-Max. These supplements have given my son a completely new lease of life. The improvement is massive, really tremendous. It has been years since I have had the comfort of knowing he can go out without needing a change of clothes in case of accidents. The Super 8 Gold has made it possible for him to go out on day trips without having to worry about this. He recently went to the cinema with his new carer with no problems, without Super 8 Gold this would not have been possible. These products have brought comfort to our whole family. I do not work and struggle to afford these products, it would be a disaster for my son if these products were to be increased in price due to Vat being applied at 23% as I would most certainly not be able to afford them. I am in my 70’s but I want to stay in good health for as long as possible. I do have osteoporosis which means I have to stay active and keep my joints moving. I have been taking Udo’s Oil for around 6 years now. I also take Udo’s Microbiotics and other supplements to boost my immune system. Having to pay VAT on food supplements would cost me around €250 extra annually – or to put it another way €5 weekly which would cancel out the increase to the old age pension in this year’s budget! Please contact your local TD’s to stop this insane and unjust health tax.